The Bangladesh navy (BN) took possession of its largest warship on May 23, 2013 in Alameda, Calif., with the “hot transfer” of the U.S. Coast Guard Cutter Jarvis (WHEC 725). Jarvis was ceremonially decommissioned and transferred over to the Bangladesh navy as BNS Somudra Joy (F-28) at Coast Guard Island, Alameda, Calif., in the presence of Coast Guard Vice Adm. Paul F. Zukunft, commander Coast Guard Pacific Area, and Bangladeshi Chief of Naval Staff (CNS) Vice Adm. M.F. Habib. The ship transfer marks an historic moment in U.S.-Bangladesh defense and security relations, as this is the first time such a large warship has been transferred from the United States. One more WHEC will be acquired by next year, says Habib. Prior to this, the U.S. Coast Guard (USCG) and U.S. Navy provided training and hardware, including small boats and advisors to the BN. 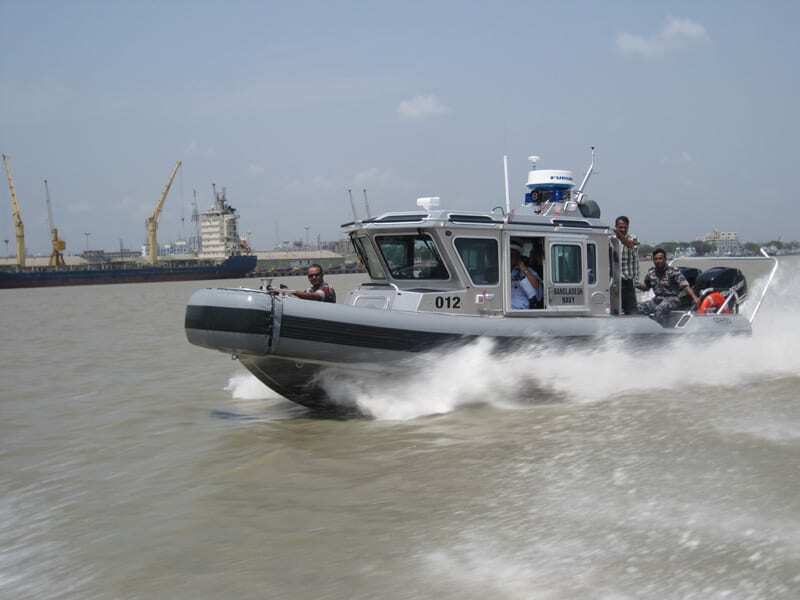 In addition, the USCG has been steadily delivering significant quantities of small craft – primarily 16 Safeboat Defenders and 20 Metal Shark Defiants, with more than 30 such craft delivered to date. Deliveries of Defiants are ongoing under the USCG Security Assistance Program. Most of these craft are used by the naval Special Warfare and Diving and Salvage (SWADS) although a few have gone to the Bangladesh Coast Guard. In particular, Habib pointed out the role played by the U.S. sea services in standing up the special warfare command known as SWADS. “SWADS has been instrumental in curbing piracy in our area,” says Habib. Upon installation of some navigational equipment, consoles and communications gear, BNS Samudra Joy is expected to depart Alameda for its home port, Chittagong, in October 2013. In due course, the ship will be fitted with an air search radar as well as guided missiles and small caliber guns, although details are unknown at this time. This acquisition is emblematic of the progress made by the BN in recent years to improve its combat power, modernize its fleet, acquire larger platforms with longer endurance and crucially, become a three dimensional navy with naval aviation and submarines, as it strives to provide effective maritime security for Bangladesh. It is doing so by modernizing the fleet with the upgrade of existing platforms as well as the induction of new platforms with long endurance. 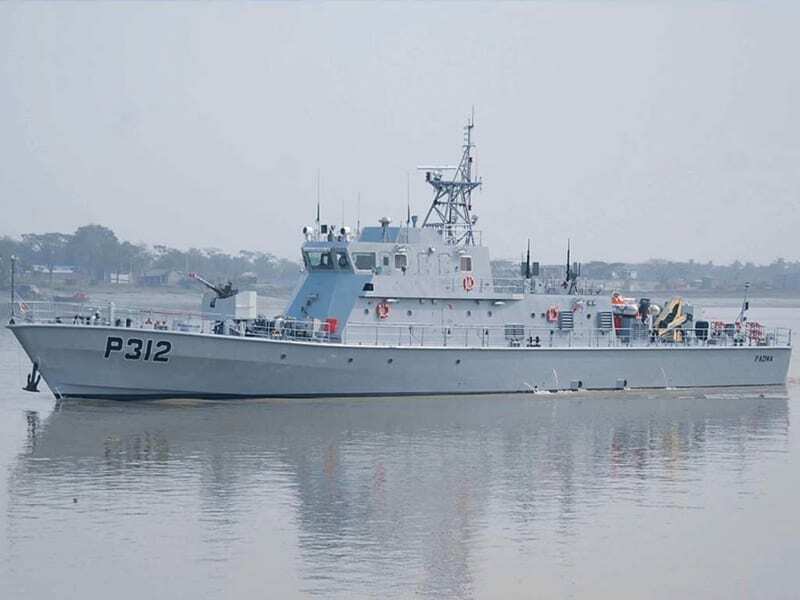 Well supported by incumbent Prime Minister Sheikh Hasina, the ongoing naval acquisition package includes 11 ships and submarines as part of the Hasina administration’s commitment to building a well-equipped navy. 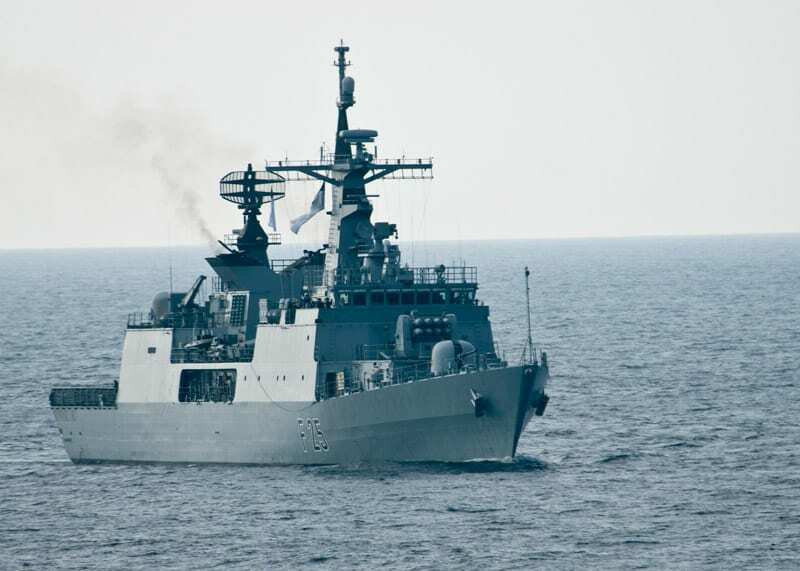 Besides the Samudra Joy, the most recent additions to the BN fleet are two large missile armed patrol craft, known as LPC, from China as well as a series of locally built, gun armed patrol craft – also of Chinese provenance. The 648-ton LPC, with a length of 64.2 meters, a beam of 9 meters and a draft of 2.5 meters, were built at Wuchang Shipyard in Wuhan under the auspices of CSOC (China Shipbuilding & Offshore International Company). The first, Durjoy (P 811), was launched on Aug. 26, 2012, while the second, Nirmul (P813), was launched on Sept. 27, 2012. Both ships arrived Bangladesh in February 2013. The LPC are armed with a single 76.2mm NG-16-1 automatic cannon, two twin 25mm cannon mounted amidships, four C-704 surface to surface missiles (SSM) mounted aft, and two forward-mounted six-barreled RDC depth charge rocket launchers. Primary sensors include a TR-47C gunfire control radar with built-in electro-optical sensors, an SR-60 search radar, and an ESS-3 bow mounted sonar with an effective range of about 8000 meters. A JRCSS combat management system (CMS) with at least three multifunction consoles is also fitted. The LPC are powered by triple Pielstick diesels driving three screws for a top speed of 28 knots. Range is 2500 nautical miles (nm) and endurance with a crew of 60 is 15 days. According to CSOC officials speaking to Defense Media Network at LIMA 2013, these are cost-effective warships, able to perform both strike missions at ranges of about 40 kilometers as well as undertaking limited anti-submarine warfare (ASW) operations. Wuchang is also building two 90-meter, 1,330-ton corvettes based on the Type 056 to bespoke Bangladeshi specifications, including a helicopter hangar. Steel cutting for these ships took place on Jan. 8, 2013. CSOC expects to complete construction of these corvettes by 2104 or early 2015. 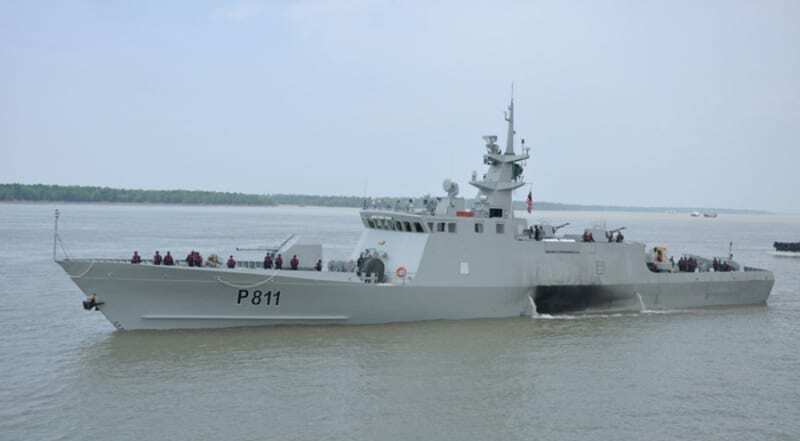 The BN has also commenced induction of five 50-meter long, 255-ton Padma-class inshore patrol craft from the Navy-owned Khulna Shipyard, using material packages supplied by Hudong shipyard in China. Billed as the largest homebuilt warship to date, the first of class, BNS Padma (P 312), was commissioned on Jan. 24, 2013. The second was delivered in early May, and all are to be delivered by December 2013. Impressively, the program is running on schedule. The long-term plan is to build 25 of these craft. Powered by four Deutz diesels, the Padma class are capable of doing 23.7 knots. They have a range of 1,500 nm and an endurance of 7 days. Armament comprises two twin 37mm gun mounts as well as two 20mm cannon. These ships can also lay mines if required. They will be used primarily for riverine patrols and exclusive economic zone (EEZ) protection. Upon completion of this program, Khulna SY is expected to undertake construction of at least two LPC, similar to the two recently acquired from China. In due course, Khulna SY reportedly will also build corvettes. Two are planned initially. In addition to the new-build ships, the BN is expecting to take delivery of two ex-PLA Navy Type 052H2 Jianghu 3 class frigates fitted with C-802 SSM around November 2013. These acquisitions mean that the two elderly ex-Royal Navy frigates of 1950s vintage, BNS Umar Farooq (ex-HMS Llandaff) and BNS Abu Bakr (ex-HMS Lynx) can finally be withdrawn from service. So, by 2014, the BN will very likely possess four additional frigates to complement a modernized Jianghu 1 frigate, BNS Osman, and a modern Daewoo-built DW 2000H frigate, BNS Bangabandhu, that’s been fitted with a Chinese-built FN-90 surface to air missile system. Aside from the combatants, at least one auxiliary tanker is under construction at Ananda Shipyard and Slipways Ltd (ASSL) for delivery by July 2013. The 79.85-meter tanker has been designed to replenish two ships simultaneously using RAS gear sourced from the United Kingdom. But the most significant new development is the acquisition of a submarine capability. Prime Minister Sheikh Hasina said that a submarine with base facilities would be added to the Bangladesh navy to build up a “deterrent force.” One or two “off the shelf” boats will be initially acquired, says Habib, to act as training boats – both for submariners and for providing much needed ASW experience to the surface fleet. It is understood that more than 100 sailors are receiving their submarine training in Turkey. What is not clear is the type of submarine to be acquired. While some sources say it is to be the Chinese Type 035B Ming class, others say that it will very likely be ex-Turkish Type 209 boats. Former South Korean Type 209 boats are also a possibility. The other significant development is the creation of a naval air arm. 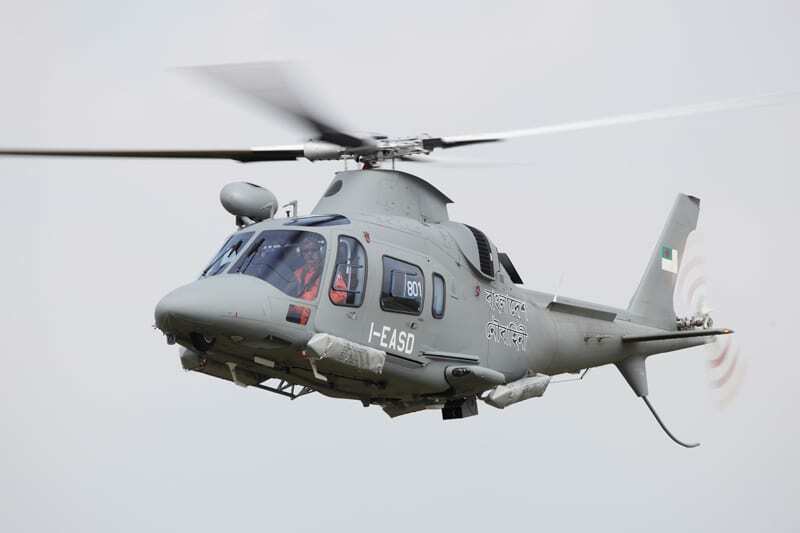 Having acquired two Agusta Westland AW 109 Power helicopters in July 2011, the nascent air arm is looking forward to commissioning its first fixed wing aircraft – two RUAG built Dornier Do 228NG maritime patrol aircraft with U.S.-built Telephonics RDR 1700B radars – in August 2013. Additional helicopters are planned, says Habib. Other sources suggest Chinese built Z-9C helicopters may be acquired along with the Wuchang-built corvettes. In addition to new acquisitions, several legacy Type 021 and Type 024 fast attack missile craft in service with 81 FAC Squadron and a couple of offshore patrol vessels with 10 FSG Squadron have been upgraded with new armament. Notably, the fast missile craft fleet has been upgraded with C-704 surface to surface missiles in place of the elderly but powerful SY-2 (NATO Silkworm) surface to surface missile. The lightweight C-704 SSM has a range of 38 – 40 kilometers (km). Two ex-Royal Navy Castle class OPV, BNS Bijoy (F35) and BNS Dhaleshwari (F36) of the 10 FSG Squadron also underwent a major upgrade program. 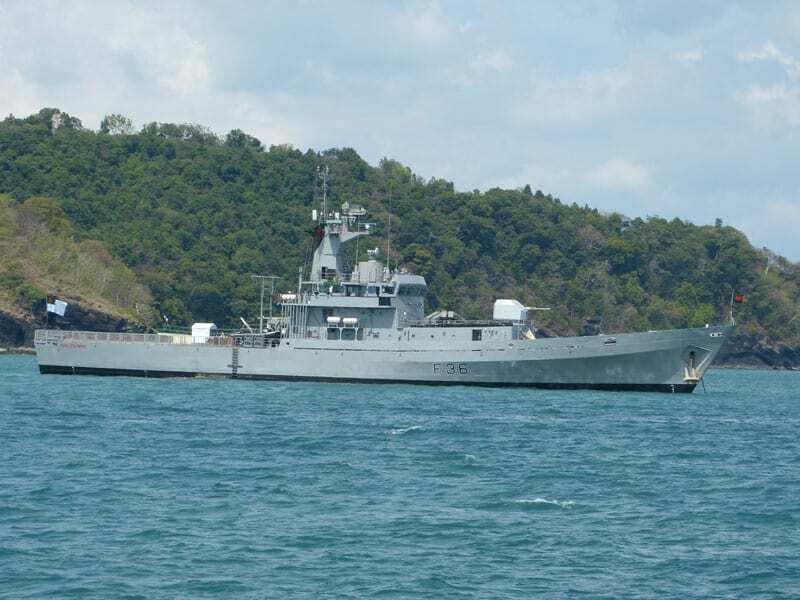 One of the class, BNS Dhaleshwari, visited Langkawi for the LIMA 2013 Exhibition. Defense Media Network visited the ship, which has been fitted with a 76.2mm NG-16-1 main gun and four C-704 missiles on the raised forecastle in 2012. In addition to these weapons, both ships received the TR47C fire control radar and the SR 60 search radar. An electronic warfare suite is to be fitted in due course to these 8-meter, 1840-ton warships. In a recent naval exercise, Dhaleshwari fired four C-704 missiles, all of which hit their targets at ranges of up to 38 km. One of four helicopter-capable ships in the BN, these two OPVs have also embarked AW109 helicopters.